We finish Book One today. Hooray! This is a good time to remind you to review, review, review. All of Book One was one, long sustained argument, an unbroken thread. You can’t just start at the end and hope to understand what the words and terms mean. Review! IT follows from this that God is His own happiness. For His happiness is His intellectual operation, as we have shown: and it was proved above that God’s act of intelligence is His substance. Therefore He is His own happiness. Again. Happiness, since it is the last end, is that which everyone wills principally, whether he has a natural inclination for it, or possesses it already. Now it has been proved that God principally wills His essence. Therefore His essence is His happiness. Notes Case in point about reviewing. “Substance” means essence or nature here. Don’t forget that we proved God’s existence and essence (substance, nature) are one and the same. 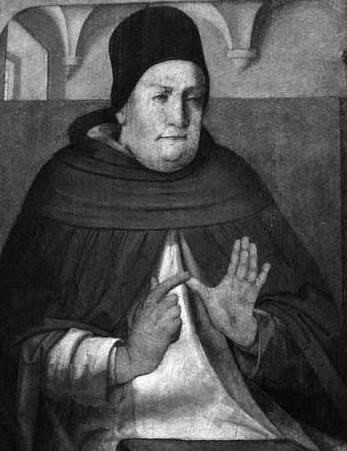 This is how Aquinas can speak of willing toward an end. Further. Whatever a person wills he directs to his happiness: for happiness is what is not desired on account of something else, and is the term of the movement of desire in one who desires one thing for the sake of another, else that movement will be indefinite. Since then God wills all other things for the sake of His goodness which is His essence, it follows that He is His own happiness, even as He is His own essence and His own goodness. Moreover. There cannot be two sovereign goods: for if either lacked what the other has, neither would be sovereign and perfect. Now it has been shown above that God is the sovereign good. And it will be proved that happiness is the supreme good since it is the last end. Therefore happiness and God are one and the same. Therefore God is His own happiness. Notes We also proved, again starting at Chapter 13, that God has to be one essence. (That He is three persons we haven’t come to yet.) Since He is one, there can only be one sovereign good. FURTHERMORE, from what has been said we are able to consider the excellence of the divine happiness. For the nearer a thing is to happiness, the more perfectly is it happy. Hence, although a person be called happy on account of his hope of obtaining happiness, his happiness can nowise be compared to the happiness of one who has already actually obtained it. Now that which is happiness itself is nearest of all to happiness: and this has been proved to be true of God. Therefore He is singularly and perfectly happy. Notes A simpler argument you’d be hard-pressed to find. Notes To which we can only say: Amen. False and earthly happiness is but a shadow of that most perfect happiness. For it consists of five things, according to Boethius, namely pleasure, wealth, power, honour and renown. But God has the most supreme pleasure in Himself, and universal joy in all good things, without any admixture of the contrary. For wealth He possesses in Himself an all-sufficiency of all good things, as we have proved above. For power He has infinite might. For honour He has supremacy and governance over all things. For renown He has the admiration of every intellect which knows Him in any degree whatever. Notes Whatever else you think of the arguments above, and because we all agree there is such a thing called “happiness”, is Boethius right? How much can we distinguish between wealth and power? If you have power, do you need wealth? If you have honor do you need renown? Our culture obviously treasures renown and disparages honor. Anyway, as The Philosopher said, all these point towards one happiness, which is, of course, God. TO HIM THEREFORE WHO IS SINGULARLY HAPPY, BE HONOUR AND GLORY FOR EVER AND EVER. Maybe this proves the Big Bang! God was so warm and fuzzy and happy he just exploded! The word “term” as in “the term of the movement of desire” (ad quam terminatur motus desiderii) means the “end” or “finality.” One cannot desire simplicitur. One must desire something. That something is the term. It is contrasted with the “principle,” which means a first cause or initiation. Living beings are defined as being the principle and term of their own motions. The English word “happy” meant “lucky, favored by fortune, being in advantageous circumstances, prosperous;” of events, “turning out well,” (from hap “chance, fortune”). See “happen,” “happenstance,” “hapless,” “mayhap,” “perhaps,” etc. for comparison. To be blessed then is to be fortunate. See the “beatitudes” for examples, beatitudo being the Latin word under translation. …and gay “meant” something different in our living memory. This series was described as a “liberal translation” right at the start. Any statement can be broken down if one is prepared to disagree with the meaning of any given word. This approach renders any literature silly or nonsense. I’m not convinced that most English speaking humans wouldn’t know the intended meaning if not the feeling of “happy” even if they feel unhappy. They know something is missing and they call it happiness. I consider the state of faith in God versus no faith in God to simply be a whim of temperament which becomes ossified or fixed by more of the same temperament which informed the initial faith. Since nobody knows some are contented one way to believe in God and others not. So by their very temperament atheists have the difficulty of ultimate apparent settlement with an unsatisfactory assertion which is defended from a position of discontent. So this is in my view where the resentment and anger originates which seems by observation to be inherent in the non believer. The believer is also not contented either with what is known of the universe with all it’s complexity and unknowability. So contentment or happiness is sought where it most patently obviously (to them) is found! No discussion is ever complete without some form of sarcasm, anger, sneer, claim of intellectual superiority or other unpleasantness. It’s ALWAYS there. That is pure temperament, not rational and utterly human and forgivable. “it just is” is the atheists doctrine and can necessarily only ever be so. It’ lacks integration with our experience of the universe and which must necessarily inform our thoughts. Such negativity can’t easily inspire great things and must be enervating. There’s no such thing as agnostic. It’s 0 or 1.